According to Stanford University statistics professor Thomas Cover, the chances of that happening are smaller than getting struck by lightning (one in a million), being hit by an errant ball at a baseball game (one in 1.5 million) or winning the lottery (one in 100 million, depending on the game).So, how did it happen? On Saturday, Denville native Demauro and her friend John Capra decided to indulge their yen to bet. Their Atlantic City jaunt began innocuously enough, with Demauro, only a casual casinogoer, planting herself in front of a penny slot machine on the Borgata floor and Capra going off to try his hand at three-card poker.By 8 p.m., a few hours later, Demauro had grown tired of the slots. She ventured into the poker room to collect her friend, who was losing money. He offered to show her how to play craps. Of the 14 available craps tables, they sidled up to the nearest one and waited for the three other players to finish rolling. Capra shot next, but sevened out quickly. Then, he handed Demauro the dice. Craps is known as the world’s most common dice game and it is played, with varying rules and sizes of table, in virtually every casino on the planet. Craps is a game of chance rather than skill, and with a low house advantage — around 1.4%, which makes it harder to beat than blackjack but easier than roulette — even novices can win. That is, if they’re lucky. 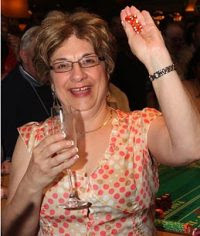 According to the casino, Demauro started her roll at 8:13 p.m. She bought into the game with $100 and when the orange-colored dice came around to her, she rubbed her hands together and let them fly. Demauro says she had played craps only once before, and being an inexperienced better, followed Capra’s advice when placing bets. A craps turn begins with an initial or “come out” roll, in which the player tries to establish a “point number” — that is, when the dice add up to four, five, six, eight, nine or 10. Once that happens, the player must roll the point again before throwing a seven, which is statistically the most likely outcome on a pair of dice. If the player rolls a seven before the point, the turn ends. As soon as Demauro hit her point number (eight), people started betting. She says the game moved so fast after that, she couldn’t really keep up. “There are all these terms I didn’t know,” Demauro says. “People were yelling out ‘Yo. '” I said to John, ‘What’s “yo?”‘ I think that’s an 11.”The table filled up and a throng of spectators gathered. Demauro rolled double sixes, hard fours, snake eyes, every possible combination of the dice. Some people called out requests and Demauro managed to fulfill them. Players from the nearby blackjack table came over to watch, and then came the casino executives, or as she describes them, “men in dark suits.” Demauro and her audience knew they would never witness anything like this again. “There was a woman there, and we happened to catch each other’s eyes,” Demauro says, “She smiled at me, and I smiled and said, ‘I don’t know how to play the game. '”Although there is no official organization that keeps track of gambling world records, a number of clubs record significant dice rolls. Before Demauro’s, the longest craps roll lasted three hours and six minutes — accomplished at a Las Vegas casino in 1989, with 118 rolls. And according to gambling expert and author of Beat the Craps Out of the Casinos, Frank Scoblete, the highest number of successive dice rolls was 147, thrown by a man operating under the pseudonym the “Captain” in 2005. The average number of dice rolls before sevening out? Eight. Given the rules of the game, there are any number of ways to achieve 154 consecutive rolls without crapping out, though all of them are highly unlikely. Unlikely but not impossible. Stanford’s Cover explains: “Let’s say we have a million gamblers trying a thousand events at any one time. That’s a billion different rolls of craps.” Out of a billion different games, the probability of getting an event that special is reduced to one in 1,000. “It’s not out of the realm of possibility,” he says. Demauro declined to reveal how much money she won, but gambling experts estimate that if she made good bets, her winnings were probably in the hundreds of thousands; expert bets would have put them in the millions. Demauro and Capra spent the rest of their holiday weekend in Atlantic City, and even returned to the same craps table two nights later — but only as spectators. “The expectations were too high,” she says. “I wasn’t ready to be the shooter again.”Once the shock of her good fortune wears off, however, she says she’ll try throwing the dice again. After all, sometimes lightning strikes twice. Previous articleCan Orlando closeout Cleveland at home?